Peter Shaw Ashton, the Charles Bullard Professor of Forestry Emeritus and former director of the Arnold Arboretum, has won the prestigious Japan Prize for his "significant contributions towards solving the conflict between human beings and the tropical forest ecosystem." The annual award, by the Science and Technology Foundation of Japan, honors people from around the world whose original scientific and technological achievements have advanced knowledge and served the cause of human peace and prosperity. The prize, announced Jan. 11, will be presented during a ceremony in Tokyo on April 19. Ashton was one of three winners this year. Japan Prizes were also awarded to Albert Fert and Peter Grunberg for the discovery of giant magnetoresistance, an advance that led to rapid increases in the amount of memory held on computer hard disks. The prize includes an award of 50 million yen for each winner, or roughly $415,000. Ashton's early career was marked by work on the taxonomy and biogeography of major tropical forest trees. He clarified a system of tropical forest classification and distribution still in use today. Ashton's most prominent work cited by the foundation in giving the award is his leadership since the 1980s in research projects aimed at conservation and the sustainable use of tropical forests. Co-founder of the Center for Tropical Forest Science at the Smithsonian Tropical Research Institute, Ashton promoted a network of "Forest Dynamic Plots" to examine their biological diversity, biological productivity, and role in stabilizing global climate. The network has grown to large proportions, encompassing 18 plots holding 6,000 species and 3 million individual trees, which are subject to a census every five years. "Dr. Ashton ... made an extraordinary effort to bring about the success of this project," the foundation wrote in its award statement. "He thereby brought us enormous biological and ecological knowledge indispensable for establishing the technology of the conservation and restoration of tropical forests." Further studies conducted at the sites are expected to expand into the traditional uses of forests by local people, socioeconomic analyses on sustainable forest use, and the effects of economic growth on forest ecosystems. Robert Cook, the Arnold Arboretum's current director, called the Japan Prize an "exceptional achievement" and said that Ashton's scientific and conservation work is based on a profound understanding of tropical forests of Asia from years of studying them firsthand. "In a tradition, so exemplified at Harvard by E.O. Wilson and Ernst Mayr and going back to Charles Darwin and Alfred Russell Wallace, Peter spent many of the early years of his career in the field, immersed in those tropical forests, often at great personal risk but out of love for the wild," Cook said. "As with those before him, he is a true natural historian first, and an exceptional scientist thereafter." Ashton praised the Science and Technology Foundation of Japan for recognizing that work in the area of tropical forestry is worthy of attention, saying that field biology often goes unnoticed by prize-granting organizations. Global diversity, he said, is heavily dependent on tropical trees, as they provide the structure for tropical forests. In addition, he said, the trees' chemical defenses against insects and herbivores spur evolution forward, as species dependent on the trees develop countermeasures to neutralize the trees' defenses. "They are the frame of the forest and they create the chemical interactions that lead to enormous diversity," Ashton said. "They're working all the time to create uniquely repulsive chemicals. The chemistry mediates natural selection and that leads to this tremendous biodiversity." Ashton became interested in forests when he was a child in the south of England during World War II. Because France's fields were neglected during the war, all sorts of insects, particularly butterflies, were able to proliferate, some of which drifted over the English Channel to the forests where Ashton walked. "I had all this wonderful time to walk in the woods. I was entranced by the beauty of it," Ashton said. "Then these wonderful creatures started floating into the forest. I was staggered, and it got me really interested." Ashton's interest focused on tropical forests after a summer trip to the Amazon while an undergraduate at Cambridge University, where he received a bachelor's degree in 1956, a master's degree in 1960, and a doctorate in 1962. Ashton said his wife, Mary, has been crucial to any success he's had, describing himself as a "disorganized person" kept on track by his wife's orderliness. His plans for the prize money are still being formulated, he said, but he'd like to set up a fellowship to encourage graduate work in the forests and to aid students from the countries that are home to the forests. He also plans to use the money to further a book project on his research in the forests. Ashton became the director of Harvard's Arnold Arboretum and Arnold Professor of Botany in 1978, posts he held until 1987. 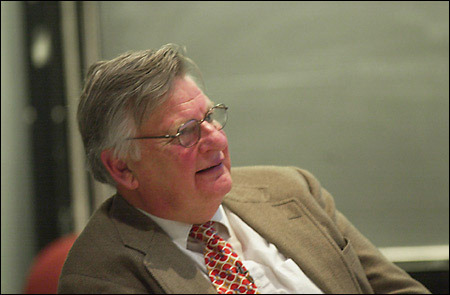 He was professor of dendrology at Harvard from 1978 to 1991, when he became Charles Bullard Professor of Forestry. He became Bullard Research Professor in 1999 and Bullard Professor Emeritus in 2004. He has been a faculty fellow at the Center for International Development since 1998. Ashton received the Environmental Merit Award from the U.S. Environmental Protection Agency in 1987 and UNESCO's fourth Sultan Quaboos Prize for environmental preservation in 1997. Ashton said the biodiversity held in the forests is irreplaceable and modern society needs to do what's needed to preserve it. He compared the genetic information held in the tropical forests' multitude of species to the knowledge held in the great libraries of the world, valued and guarded by people even though some books are looked at very rarely.